Joe Schmidt’s youthful Ireland side continued their impressive form this month with a 50-22 victory over Japan at Ecopa Stadium in Shizuoka. Having trounced the US Eagles 55-19 in New Jersey last Saturday, Ireland have travelled to Tokyo to take in two Tests against the Brave Blossoms, who they will face in Pool A at the 2019 World Cup. Missing 11 frontline players on British and Irish Lions duty in New Zealand and with Test stalwarts such as Jamie Heaslip, Rob Kearney and Sean Cronin taking the summer off to recover from injuries, Schmidt is using this month’s tour to broaden his base of talent as Ireland build towards the next World Cup. Ireland proved far too good for the home side and were cruising 31-3 at the break thanks to an early try from the outstanding Keith Earls, a brace from flanker Dan Leavy on his first Test start, and a late effort from Jack Conan. The one-way traffic continued in the second-half as Conan, Garry Ringrose and Earls added further tries. Fly-half Paddy Jackson had a flawless day with the boot adding 13 points with Rory Scannell kicking a second-half conversion. Japan replied with second-half tries from full-back Ryuji Noguchi, wing Kenki Fukuoka and replacement scrum-half Yataka Nagare. Ireland drew first blood in the sixth minute when Conan and captain Rhys Ruddock made big inroads with ball in hand. Japan were penalised for straying offside allowing Jackson to make it 3-0 from the tee. Minutes later, a monstrous scrum from the Irish pack shoved their Japanese counterparts off their own ball with Conan seizing possession and charging downfield. The Leinster player then offloaded superbly to Earls, who raced away for the opening try. Jackson nailed the extras to make it 10-0. There was some brief respite for Japan when Conan was penalised for obstruction at the ruck allowing Japan fly-half Yu Tamura to make it 10-3 from the tee. Earls, who is having a storming month, scythed through the Japanese defence but was hauled down metres short of the line. Cian Healy powered on from the next ruck before tighthead Heiichiro Ito was subsequently sent to the sin-bin by referee Marius van der Westhuizen for killing the ball in the deck. Ireland took full advantage as Jackson kicked to the corner. From the resulting line-out, Quinn Roux rose high to take th e ball before feeding the onrushing Leavy who steamrolled over opposite number Yoshita Tokunaga to score. It was all too easy as Earls went through a yawning gap before offloading to Leavy who went over his second try in as many minutes. Jackson converted both tries to make 24-3 with 30 minutes on the clock to leave the home side reeling. Things went from bad to worse for Japan as Conan raced onto Earls’ deft pass to canter over from 20 metres for Ireland’s fourth try of the first half. Jackson fired over the touchline conversion as Ireland headed for the half-time break 31-3 to the good. It was far too easy as Conan raced through some flimsy Japanese defence to bag his brace early in the second half. Jackson continued his fine form from the tee as Ireland stretched their lead to 33 points. Ireland lost Andrew Conway to the sin-bin in the 51st minute after the Munster wing was ruled to have caught Fukuoka with a high tackle as the Japan flyer charged for the line. The Brave Blossoms were finally rewarded with their first try of the game as Noguchi powered over from close range. Substitute Rikiya Matsuda added the conversion to make it 38-10 on the hour mark. Normal service resumed thereafter as Ringrose jinked his way past Japan flanker Michael Leitch to register Ireland’s sixth try. Scannell, who assumed kicking duties when Jackson left the fray in the 61st minute, fired over the touchline conversion. Replacement loosehead Dave Kilcoyne punched a huge hole in a tiring Japan defence to get Ireland on the front foot once more. 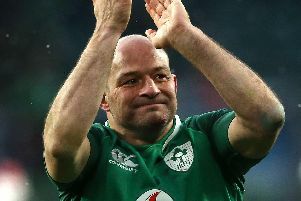 Leavy carried strongly again before Earls picked up at the base of the ruck to sneak over for his second try as Ireland hit the 50-point mark. Japan finished strongly with Fukuoka racing past Ireland scrum-half Luke McGrath for a late score while Nagare had the final say with a try at the death, but they were merely consolations.